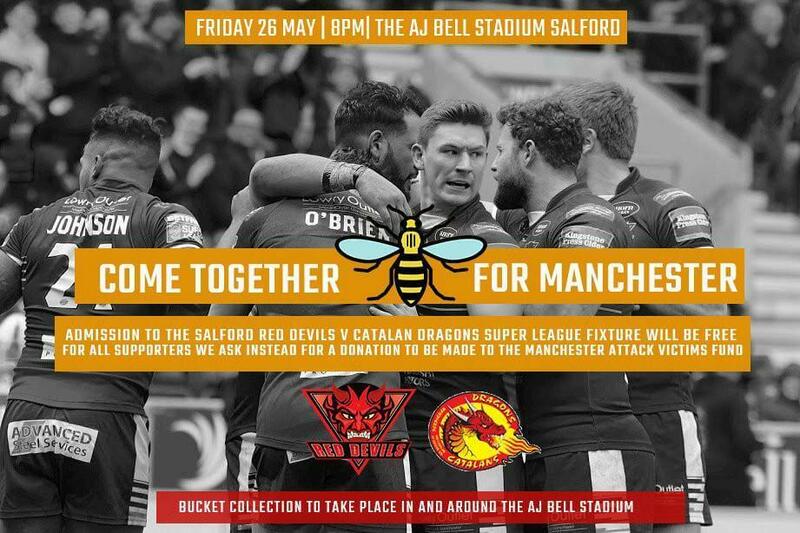 After the recent tragic events in Manchester, Salford Red Devils have come up with a tremendous offer. They are allowing everyone into their upcoming game against Catalan Dragons completely free. The guys on the gates will not be taking tickets, instead, they will be replaced with a donations box for the victims of the Manchester attacks. We would like to encourage everyone to get down to the AJ Bell Stadium whoever you support. If you’ve never been to a Rugby League game before why not make this your first and show your respect, please be generous with your donations. Breaking: Entry fee to Friday’s game will be voluntary. All proceeds will go to support fund for the victims of the Manchester attacks. The game kicks off at 8 pm on Friday 26th May 2017. If you are new to Rugby League and aren’t sure about the rules, take a look at our guide.